Defending clients in securities fraud class actions, SEC enforcement investigations and related derivative suits. Calfee’s Securities Litigation attorneys have extensive experience defending clients in securities fraud class actions, SEC enforcement investigations and related derivative suits. We follow and participate in developments in SEC enforcement and the securities class action bar and understand the interplay between the boardroom and shareholders for public, private or closely held corporations. Whether parallel civil and regulatory actions, internal or external investigations, disclosure requirements, governance and compliance issues, insurance coverage, or business judgment, Calfee’s Securities Litigation team has the experience and judgment to provide definitive counsel no matter where the process leads. Led by attorneys who have spearheaded defensive investigations and responses throughout their careers, the team also includes both securities and governance attorneys with experience representing businesses, issuers, underwriters, shareholder groups, directors and officers and public bodies, as well as trial lawyers experienced in complex, bet-the-bank civil litigation and criminal trials. 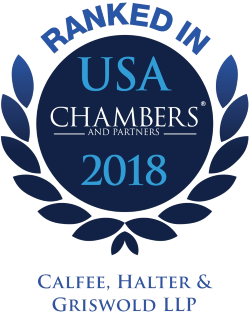 For well over a decade, our Litigation group and individual litigation attorneys have been ranked and recognized by Chambers USA: America's Leading Lawyers for Business, an industry-leading legal resource for professionals in search of qualified, experienced legal counsel. In 2018, Chambers USA researchers report that Calfee's Litigation group is known for frequently advising on "plaintiff and defense-side commercial litigation matters, offering considerable strengths in securities, product liability, antitrust and construction disputes... [they also offer] experience in criminal litigation, defending a range of individuals and businesses facing regulatory enforcement actions. [They act] for clients in sectors including healthcare, financial services and manufacturing." Calfee was selected for inclusion in the 2019 "Best Law Firms" rankings by U.S.News –Best Lawyers in America in Securities / Capital Markets Law, Securities Regulation Law, and Regulatory Enforcement (SEC, Telecom, Energy) Litigation (National and Metropolitan Cleveland rankings). Calfee has been selected for inclusion by Benchmark Litigation 2019 as a "Recommended" litigation firm in Ohio. Several of Calfee's Litigation attorneys have been ranked as Leading Litigators by Benchmark Litigation 2019. Officers and directors of publicly traded medical equipment manufacturer in related securities fraud and ERISA class actions alleging fraud and breaches of fiduciary and other duties in regard to disclosures regarding regulatory compliance programs. Publicly traded insurance company in securities class action arising out of successful merger. Utility company in four separate securities class actions regarding tax and accounting issues. Private equity fund in securities class action arising out of successful merger. Underwriters in IPO-related securities fraud class action. Accounting officer in class action alleging securities fraud based on disclosure and accounting issues; obtained complete dismissal. Former executive of financial company in class action alleging securities fraud. Publicly traded company in SEC whistleblower investigation. Publicly traded company in oil and gas industry in FCPA investigation by SEC, resulting in close-out letter, with no further action, from SEC. Former executive of financial company in SEC investigation. Publicly traded financial institution in FINRA investigation. Publicly traded financial institution in SEC investigation. Publicly traded company in DOJ and SEC securities fraud investigation. Officer of investment advisory firm in SEC investigation. Publicly traded coatings company in SEC investigation resulting in closing of investigation with no further action by SEC. Publicly traded insurance company in derivative action arising out of successful merger. Officers and directors of publicly traded medical equipment manufacturer in shareholder derivative action alleging breaches of fiduciary duties in regard to regulatory compliance programs. Current and former outside directors of publicly traded financial institution in shareholder derivative suits alleging breaches of fiduciary duty and violations of federal securities laws. Directors of publicly traded company in shareholder derivative action alleging stock option back-dating. CEO of publicly traded company in shareholder derivative action arising out of restatement of financials. Accounting officer of publicly traded manufacturing company in shareholder derivative action regarding accounting and disclosure issues; obtained complete dismissal of claims. Former outside directors of privately held company in action alleging breaches of fiduciary duties tied to equity investments and debt offerings.